The date of Russian-Canadian Jewish sculptor Abrasha (Abraham) Lozoff's immigration to England is unknown, but is likely to have been sometime in the 1920s. He had previously trained under the French sculptor Bourdelle. In his decade in England, he exhibited once only with the London Group (as a non-member) at their summer exhibition in June 1926 and by the late 1920s he had a studio in London's Ladbroke Grove on the former site of the Mercury Theatre, where he worked in a variety of materials including plaster, wood, metal, stone and - at the time of his death - jade. His sculpture was also shown at the Royal Academy in 1934 and on a number of ocassions at Ben Uri, where an exhibition of 'Wood Carvings by Abraham Lozoff' was shown alongside 'Paintings & Sculpture from the Permanent Collection' at the Ben Uri Gallery, Portman Street in October 1950. He is also represented by a work in the Tate collection, 'Venus and Adonis' (c. 1925-30). In an obituary in the 'Jewish Chronicle', Louis Snowman called him 'one of our ablest sculptors, an artist with more than a touch of genius and of the greatest potentialities' (4 September 1936). The sculpture of Russian-Canadian Jewish sculptor Abrasha Lozoff combined the disparate influences of Grinling Gibbons and Gauguin. 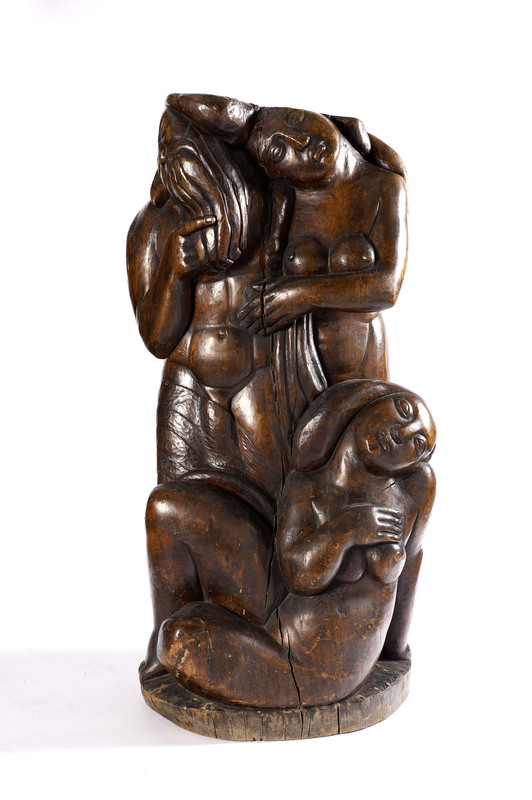 His extraordinary woodcarving Lot and his two Daughters, later donated by Lord Sieff to the Ben Uri), was exhibited at the London Group's summer exhibition in June 1926 (Lozoff's first and last showing with the Group). It was judged by the art critic of 'The Times' to be ‘not as good as it looks, owing too much to its Far Eastern reference, though it is evidently the work of a man who knows his job’. The criticism may have also have been provoked by the enormous £1,500 price tag. The work was later presented to the Ben Uri by Lord Sieff in 1936 and a sketch of the same subject (lent by Mr. Charles A. Lever) was exhibited at Ben Uri's autumn exhibition in 1951.